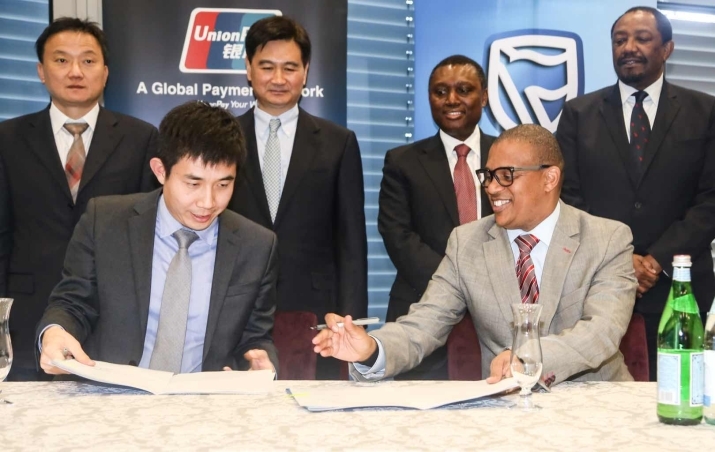 South Africa's Standard Bank and UnionPay International, one of the largest card payment organizations in the world, signed a memorandum of understanding in Johannesburg on July 23 that will accelerate access to UnionPay’s cards across key markets on the African continent. The move will make it more convenient for Chinese people transacting in Africa and smooth the way for easier payments by South Africans doing business or traveling in China. When formally launched, the UnionPay card will enable users from China to transact initially using Standard Bank electronic facilities in South Africa and 10 Standard Bank markets across Africa. Using their UnionPay cards, Chinese users will be able to pay for services on Standard Bank-issued POS terminals and also access the Standard Bank ATM network. For South African business travelers to China, UnionPay cards issued in South Africa by Standard Bank will bring new levels of convenience. In future, payments and transactions will take place through swiping of cards at merchants and at any ATM across China. The problems associated with carrying cash for all payments will, therefore, become a thing of the past. As payment apps are popular in China and most are UnionPay enabled, Standard Bank‘s UnionPay capability will allow Africa-based business people and tourists with Standard Bank accounts, cards or online payment products to access the full range of payment apps currently used to transact in China. “The partnership will play an important role in expanding the commercial ties that join our regions, accelerating economic development, job creation and industrialization. We are honored to be the first African bank to be licensed to issue UnionPay cards in South Africa,” Sim Tshabalala, CEO of the Standard Bank Group, said at the signing ceremony. Chairman of China UnionPay Ge Huayong, said that the collaboration between the two institutions will further ensure smooth cross-border payments between China and Africa, offering stronger support for China-Africa trade and personnel exchanges. "On the basis of constantly improving our acceptance network and promoting local card issuance, UnionPay is willing to carry out extensive collaboration with local institutions in Africa. UnionPay will also expedite the launching of our innovative payment products, such as UnionPay QR code payment and UnionPay cross-border B2B platform. This will offer tailored payment services to the local markets and customers, and to support the development of financial inclusion in Africa,” said Ge. UnionPay International is a subsidiary of China UnionPay focused on the growth and support of UnionPay’s global business. In partnership with more than 1,800 institutions worldwide, UnionPay International has enabled card acceptance in 170 countries and regions with issuance in 48 countries and regions.